Trevor Noah, a South African comedian little known to U.S. audiences, will replace Jon Stewart as the host of the Emmy Award-winning, late-night parody newscast "The Daily Show," Comedy Central said on Monday. The Viacom Inc-owned network said it selected Noah, 31, because he is an "enormous talent" and "wickedly funny." His premiere will be announced at a later date. "He and the team at 'The Daily Show' have created an incredible show whose impact is felt over the world," Noah said in a statement. "I'm excited to get started and work with such a fantastic group of people." South Africans celebrated Noah's big step up, saying his talents will appeal to a global audience and he will change people's perceptions of their country, which is still grappling with the legacy of apartheid-era human rights abuses. "Over the years, Mr. Noah has proved that laughter is the best medicine and has helped our country and its people to find healing through laughing at themselves," said Minister of Arts and Culture Nathi Mthethwa. Noah's appointment marks the second major handover at the comedy cable network. Larry Wilmore took over Stephen Colbert's time slot in January after he left the network to succeed David Letterman, who is retiring in May as the host of CBS Television's "Late Show." But Noah is younger than the middle-aged Wilmore, Colbert and Stewart, who said last month he was giving up the gig but gave no clues about his next career move. Stewart was 36 when he became the host of show in 1999. During his long tenure, the show, which airs weeknights at 11 p.m. and averages slightly more than a million viewers each night, became influential in U.S. politics and culture. "Very excited to welcome our next host: @Trevornoah! That's right - another guy in late night from Soweto," Stewart said on Twitter. Noah, who was born to a black South African mother and white Swiss father, made his mixed race a big part of his comedy. During his childhood under apartheid laws, blacks and whites were prohibited from living together. "They had me, which was illegal, so I was born a crime," he said in one of his comedy routines. Noah made his U.S. television debut in 2012 on "The Tonight Show with Jay Leno." He also appeared in a one-man show, "The Racist," at the 2012 Edinburgh Fringe festival in Scotland and was the subject of an award-winning documentary film, "You Laugh But It's True," about his career in post-apartheid South Africa. In the 2013 special "Trevor Noah: African American," which is available on Netflix and DVD, he explored his sense of identity and coming to America. In one of his stand-up routines, he talked about learning to be black in America, only to be misidentified as a Mexican once he arrived. South African ventriloquist Conrad Koch said it was a huge breakthrough for a comedian from the African country to make it on the international stage. "It portrays South Africans as forward thinking, intelligent, progressive and in touch with the world," he said. "It shows how stand up is becoming more and more relevant." Koch's puppet, Chester Missing, said he hoped the comedian would deliver one of the episodes in Xhosa, Noah's home language. Other comedians, including Chris Rock applauded the decision, too. I know Trevor Noah a bit. Nice guy. I'm sure won't mind letting me host the Daily Show instead of him. So proud of my dude @Trevornoah! Here's to a new era of @TheDailyShow! But those unfamiliar with Noah were perplexed. 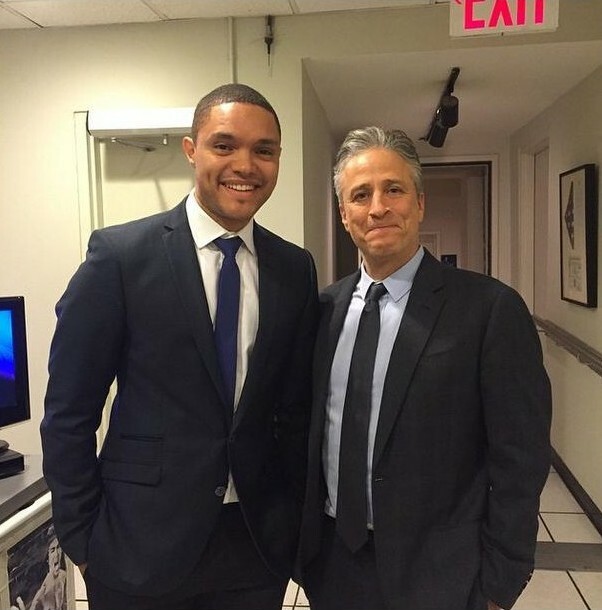 No pressure, Trevor Noah. No pressure.